HomeNew CarsMini CarsMini Cooper 3 DOORMini 3 DOOR FAQsTell me about Mini 3 DOOR interiors? 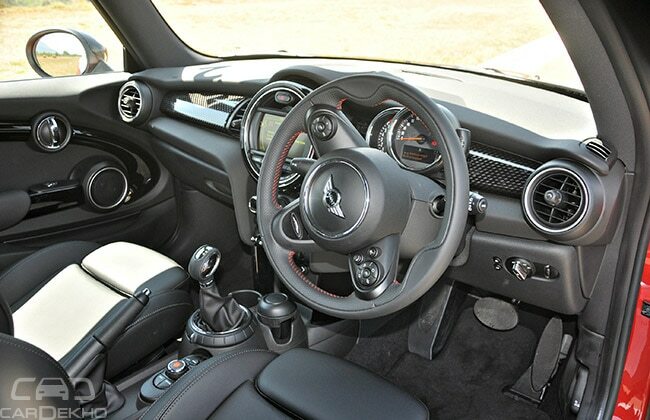 Tell me about Mini 3 DOOR interiors? Mini Cooper 3 Door comes lot of thoughtful and practical additions to the brand new interiors of the third generation car. It still has that classic large central display but it does not show speed anymore, instead it has a cool new Mini connected infotainment screen. Speedometer and rev counter are now mounted behind the steering wheel. The power window switches have also moved to the doors, compared to the previous Mini’s centrally mounted ones. The retro switches like the previous Minis are still there on the central console and looks very attractive. At the center it has MINI Central Display which comes standard with a 6.5-inch screen, but Mini also offers a mighty 8.8-inch widescreen as optional. The system comes with host of connectivity options including your social media through your smart phones via MINI Connected App along with Bluetooth telephony, Aux-in and USB. You can also opt for the optional Harman Kardon music system for an additional 1.25 lacs, and yes, it is worth it. The seats are very comfortable and gives you optimum support.